This October, CNN’s Christiane Amanpour will interview Malala Yousafzai, the girl who survived a Taliban assassination attempt. Malala Yousafzai’s education initiative, The Malala Fund, can be found here. I would like to meet Malala because she has changed how I do in school because I use to fail some of my classes but she changed it because it doesn't matter who you are, what you do, what color you are it just matters if you work hard enough or not that's why I would like to meet Malala! Everyone wants to change the world. They want to make an impact, and be recognized for it. But most people are scared of the consequence. Of what might happen to them if they attempt to fight for what they believe in. But the again most people are not Malala Yousafazi. This amazing young women fought for what she believed in, and even after she faced a major adversity, she kept fighting for what she believed in. She was knocked down many times, but always got back up again. Growing up in today's society, it is hard to find a good role model. Someone you can always look up to. Someone you can always aspire to be. Malala Yousafazi, " the bravest girl in the wold", has become this person for me. She has shown so much passion and strength in her fight. The way she speaks about everything, with such a beauty, is something most people can only hope to do in their lives. To have smoking the believe in so much they would risk anything for it, even their life. 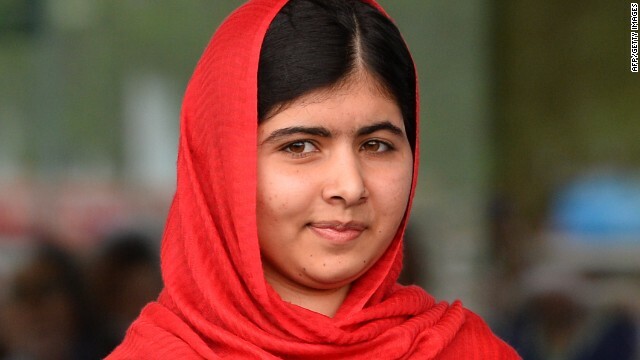 Malala Youafazi was shot in the head. Everyone thought that she was going to die, but she pulled through. She fought and won. She is not only alive, but walking and talking. How many people can say that? Malala Youafazi has changed how I view my own life. She has made me want to be a better person. I use to complain about homework, and how my teaches were so unfair. Not anymore. I have a whole new view. Now I think I'm am so lucky to be able to have this education. Also, how there are people who would die to have this opportunity, to learn and be successful. Malala Youafazi has shown me all of this. She truly is "the bravest girl in the world". She is SOOOOO brave! I can't believe that she stood up for what she believed in even though she knew the consequences. How many other people in the world would be as brave as Malala? hallo.how are you .i am ur frnd.my drems i will work in UNICEF.Please u help me.my request. After seeing the interview with Christiane Amanpour, I totally understand why the taliban (intelligenceban) wants to get rid of Malala. She has about 100 times the collective intelligence of this pack of primitive thugs! It would be an absolute miracle to meet her!